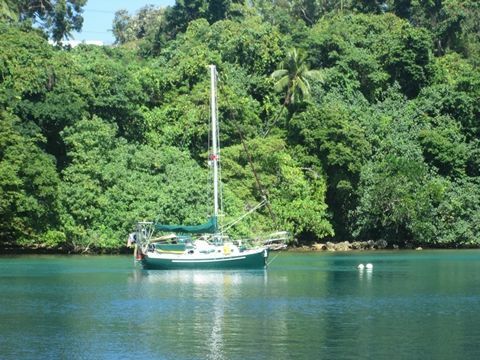 From Auckland, New Zealand and Tonga: Karen is in New Zealand waiting for Jim, who is back aboard Sockdolager in Vava’u's Neiafu harbor, Tonga, 1300 miles away. It’s been a long few weeks, and we don’t mind admitting that it’s been difficult and stressful too. First, THANK YOU for the encouraging emails and comments, they’ve buoyed our spirits. Here’s a photo of Sockdolager all snug on her mooring. Our sailing friends took good care of her in our absence. Thank you, dear friends, especially to the crews of Orcinius, The Rose, and Buena Vista, and to the folks at the Aquarium Café, on whose mooring she’s been staying. To summarize: Karen was hospitalized in Tonga with an erratic, forceful heartbeat and other symptoms that were diagnosed as Frequent Ventricular Premature Complexes. 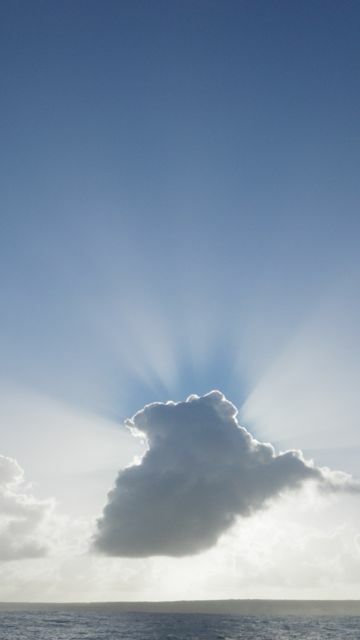 After flying to New Zealand and undergoing a battery of tests at the renowned Auckland Heart Center, the good news is that there’s no structural damage to the heart, and the frequent palpitations can be mostly controlled by medication. The bad news is palpitations like this are still not fun, nor can they be eliminated, but at least the heart has gone from feeling like a runaway diesel to a small buzzy flutter. Karen won’t be making the passage from Tonga to New Zealand. Jim will wait for a sailing friend to finish a job in the Antarctic and then join him, but if it gets too late in the season or our friend’s schedule doesn’t work out, Jim will solo the boat to New Zealand. 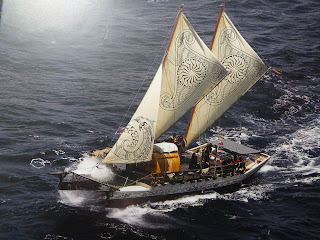 By then Karen and her doctor will know how well the medications are working, and after that we’ll both relax for awhile on land as well as on a little cruise around the Hauraki Gulf. Only then will a decision will be made on what’s next. 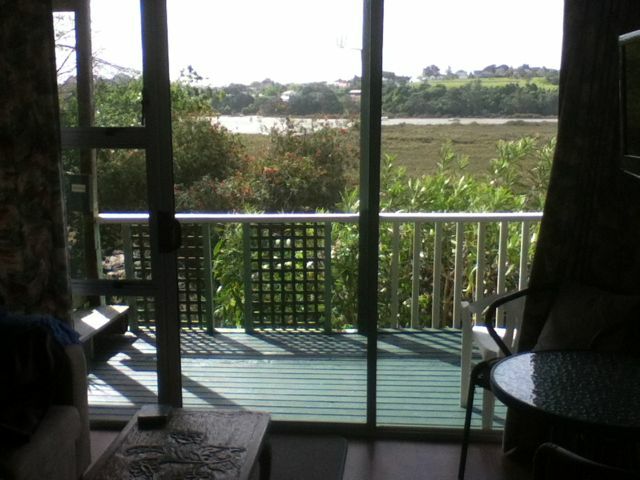 Before Jim flew back to Tonga, we enjoyed a bit of Auckland. 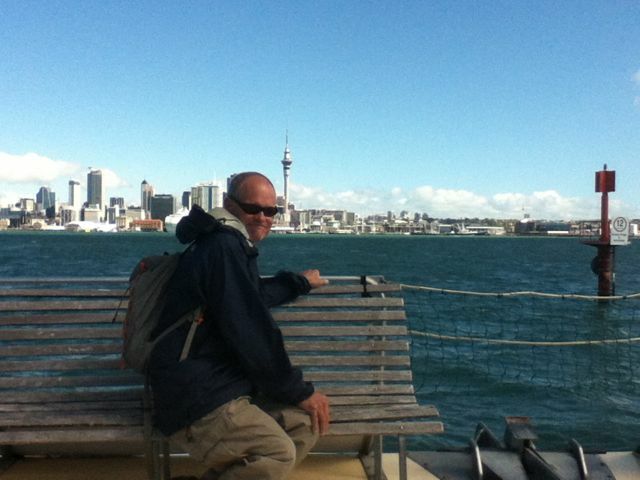 The photo below was taken on the ferry riding across the harbor to Devonport, the village suburb where the flat is. The Auckland Sky Tower is in the background. Note Jim’s haircut. Karen was as shocked as Jim was pleased with it when the barber finished. “You paid twenty bucks for that?” she asked, incredulous. “Better get used to it, I like it this short,” he said. “I could do YOU next,” said the barber, smiling. “Um, no thanks, see ya,” mumbled Karen, slinking out the door. 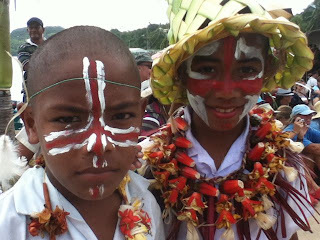 Now back to Tonga: Just before all this medical stuff happened, there was a festival where a couple hundred Tongan kids put on some fabulous dance performances. It’s fun to ask the kids to pose so you can snap a photo like the one at the top. Some of the kids try to look fierce, then crowd around you giggling when they see it. This group quickly formed, then peered at the camera and laughed. 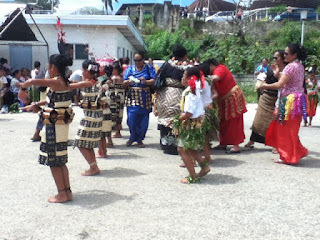 Tongans have a unique way of dancing, very different from anything we’ve seen to date. 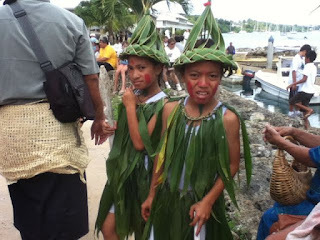 And the costumes are elaborately woven, very different from the hula skirts of other islands. Look at these girls’ costumes below. Their dancing was extremely graceful, but done mostly with the arms and hands, no lascivious hip action in this conservatively religious country. Notice the adult women walking among the young dancers. They’re stuffing money into the girls’ costumes. If the dancers do a good job, dozens of adults get up and walk right into the middle of the dance to slip dollar bills into their outfits. The kids keep dancing, but eventually get so surrounded by adults stuffing money down their shirts and into their costumes that hardly anybody can see them. The further west we go, the more wildlife diversity we encounter. In Tonga on the first evening we anchored, a large fruit bat, or “flying fox” circled our masthead. That is one big bat. 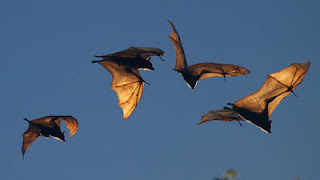 They’re relatively harmless and they make high-pitched yodeling noises at night, but if you hang a stalk of bananas in the rigging you might find small bites in all of them by morning. Even everyday, most Tongan men wear long black wraps called puletaha, that are bound at the waist with a woven mat called a ta’ovala; there are different outfits depending on the formality of the occasion. Women wear both the black wraps, the mats, and also dresses, both in bright colors, with decorative straw mats wrapped around their waists. Tongans are very circumspect. Public displays of affection, even hand-holding, are frowned on, except for schoolgirls who walk arm-in-arm. Toplessness can get a fine of $200, though only for women. So it might be that the wild hula movements and near-nakedness of islands further east are all covered up in Tonga, at least on the women, who even swim fully clothed. And yet... and yet... there is complete acceptance in Tonga, and in fact throughout all Polynesia, of Fakaleiti, or transgendered males. 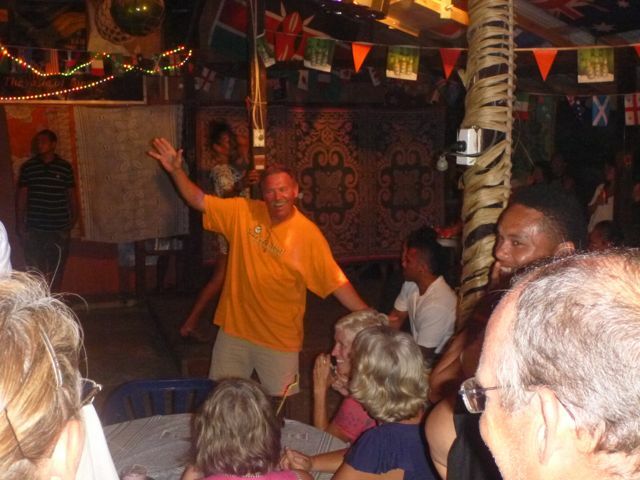 Such acceptance that the drag show at Tonga Bob's bar in Neiafu is always sold out, and everyone has a great time. A group of us yachties went to a show and enjoyed it. So nice to see no big deal made out of differences among people. Here's part of the gang just before the show, and below that is John from Orcinius after participating in the Tongan tradition of stuffing money down the dancer's costume... uh, John, that may have been just for kids. Don’t you agree that these unusual woven dance costumes are beautiful? Below are a couple of young dancers getting ready. 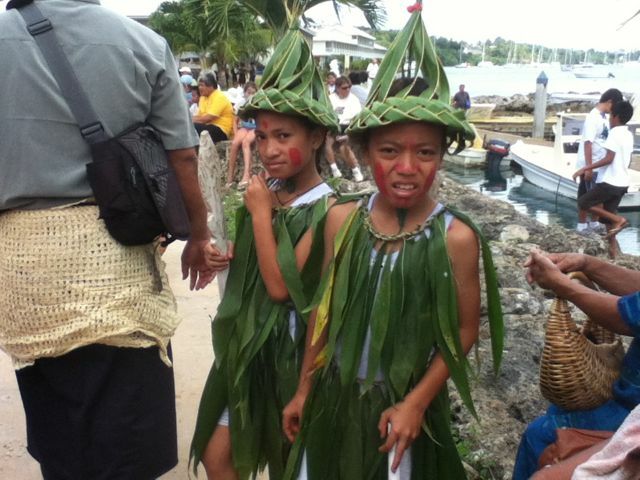 Tongans weave these pointy hats of pandanus leaves, and then nod their heads in unison while dancing. It’s easy to imagine a fierce war party doing that while stomping the ground with seedpod rattles around their ankles and gripping elaborately carved war clubs. Quite an intimidating sight because the hats make these already large people look even taller, and the hypnotically swaying pandanus leaves are mesmerizing. Tongan warriors had to be a fearsome sight. 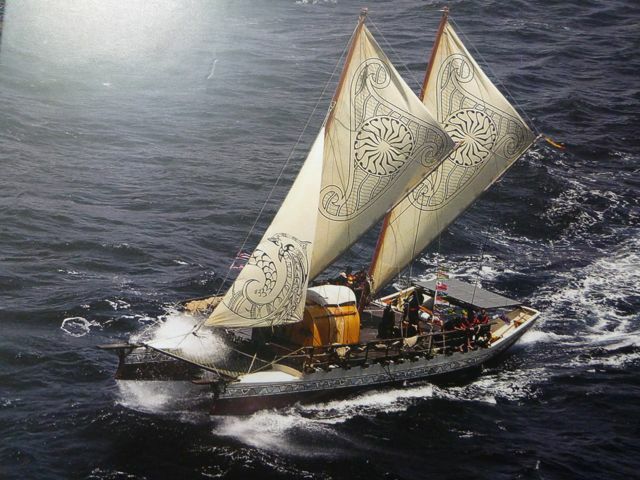 Here's a photo snapped from a post card, of the Tongan vaka, which was in the harbor. 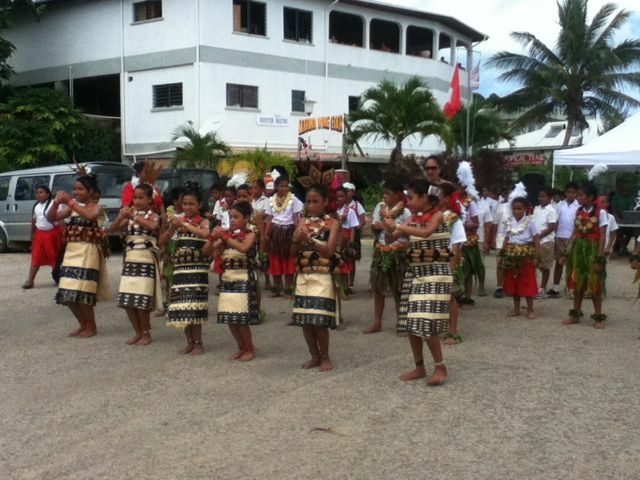 Tonga is a Kingdom, a genuine monarchy, and its royal family is revered. It's is the only Pacific nation that has never given up its monarchy to be ruled by a foreign power, (though missionaries have thoroughly reworked parts of the culture) and thus this little island nation is different from French Polynesia or the Cook Islands, which have had heavy colonial influences while still retaining varying degrees of their own individual identities. English is spoken widely in Tonga along with the native language, and there is a large expatriate community. Tongan crafts are renowned, especially baskets and tapa cloth. 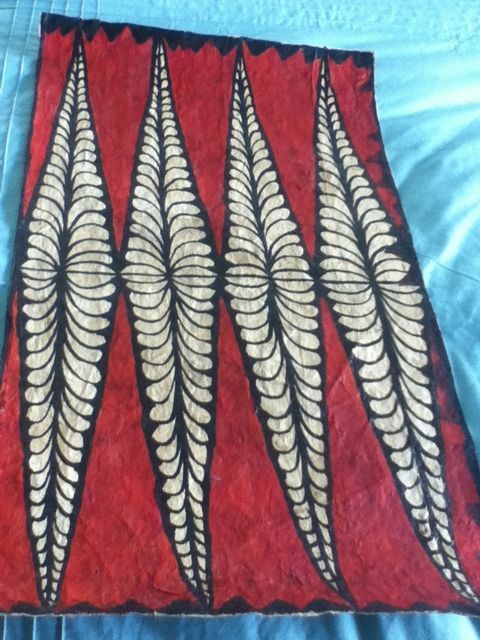 This is a traditional design on tapa cloth, made from the pounded inner bark of hiapo, or paper mulberry trees. Tonga receives a lot of foreign aid, mostly from New Zealand and Australia, but China is spearheading both infusions of cash and political agreements that could open doors to further influence from their direction. 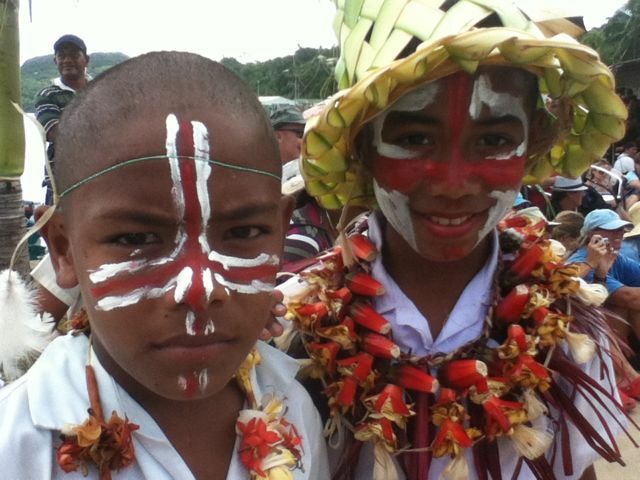 Captain James Cook named Tonga “The Friendly Islands” back in the 1700s, and the name stuck. While Tongans are friendly, they are also more reserved than people we’ve met elsewhere, and the shopkeepers in market stalls can be pushy. There is also more poverty here than we’ve seen elsewhere. With enormous fisheries and huge areas of territorial ocean ripe for seabed mining at stake in these small island nations, it’s no wonder that other countries are interested in tapping into them. Let’s hope wisdom prevails on all sides. Nowhere in Tonga nor any other South Pacific nation have we encountered any panhandling or begging, as has become so common in the US. What we’ve found throughout this voyage has been the reinforced knowledge that people everywhere are a lot alike; we all have families with issues, and we all want basically the same things. Regardless of economic or cultural differences, almost everyone has been open and friendly and as eager to learn about us as we have been to learn about them. A voyage like this is the ultimate eye-opener. That said, even traveling at 5 knots is too fast when this much ground must be covered before the advent of cyclone season. We could easily have spent much more time, at least a month, in nearly every place we visited. The medical system in Tonga is very different from what Americans and Europeans are used to, and that was an eye-opener, too. As mentioned earlier, the hospital stay in Nuku Alofa was upsetting and stressful (and sometimes humorous) and Karen will write more about that later. 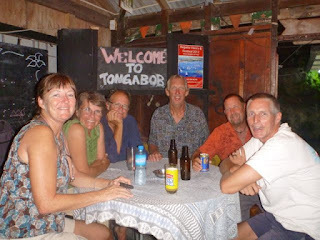 For now, with Jim in Tonga and Karen in New Zealand, we wait, and we hope for a smooth passage. I've been following your blog since you were in San Francisco. I'm relieved to hear Karen's physical issues are not more serious and are being successfully addressed. Here's wishing you both continued good health, safe travels and the hope your separation is short lived. Hi Adventurers! Well, that sounded very troubling but glad you have worked out a course of action to get things in some sort of order. Life does have its way with us. 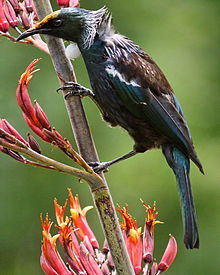 I do have a friend in Berhampore if you need another local contact there in New Zealand. (Well, sort of local - more local than any of us are at present!) Glad you are feeling more stabilized, Karen and like the haircut, Jim! I hope the sailing friend shows up soon. 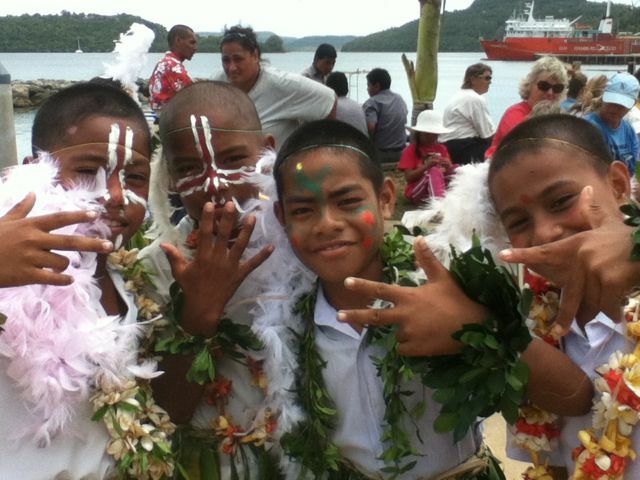 (Who do I know in Tonga....) Sorry about the complications, hope smooth sailing resumes shortly! We are enjoying some free wifi in Moorea and thinking of you guys. Take care!